Our most coveted product of Biblical fame, frankincense heals wounds, boosts the immune system and contains a beautiful aroma. 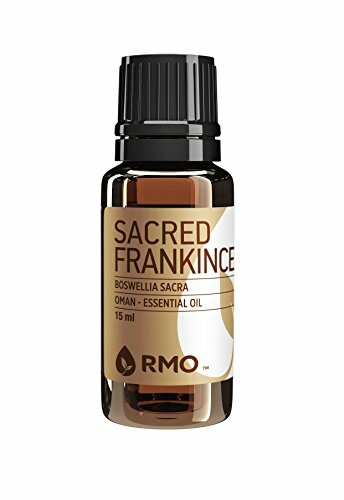 Harvested in Oman from trees that are hundreds of years old, this is the best Frankincense in the world! Massage a few drops into your chest and shoulders to improve your immune system. Use a drop or two directly on wounds to help them heal faster. 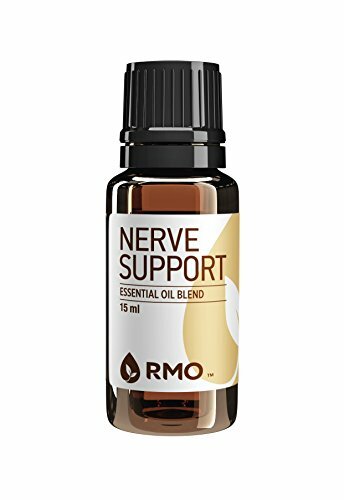 These oils assist in repairing damaged nerves, stimulates circulation, eases inflammation swelling, and cramps. It works on the parasympathetic nerves, is a great pain reliever, infection fighter, and helps in healing and repairing connective tissue that has been damaged. It is restorative, a stimulant for nerves, and assists in the regenerates of new cells. It is beneficial for nervous tension and stress and very soothing to the nerves by just breathing it in. Massage into the area where the nerves have been damaged; apply a cold compress and relax for at least 15 minutes. For an earache, apply a couple of drops to cotton and place in the ear. Massage on the shoulders, neck, across the forehead for nervous stress and tension. For a fever, add carrier oil and massage the head and back. 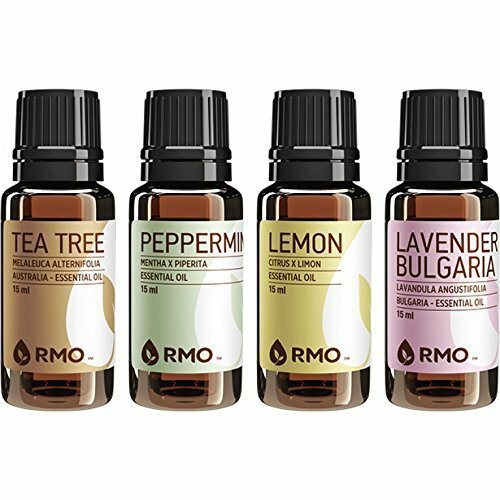 Treat your hands to an aromatic, moisterizing experience with this essential oil. Or, it is commonly used as an air purifier/freshner, bath/soaking mix or potpourri. Also doubles as a favorite element of surface cleaners and dishwasher detergents. For a moisturizer: 3 drops Frankincense 3 drops Orange 3 tablespoons Olive Oil - Mix all three together and store in a dark, glass bottle. Use at night before going to bed. Apply mixture generously over hands. Massage thoroughly. Formulated to assist in reducing pain and stimulating quicker healing. It is excellent when used for inflammation, repairing ligaments, headaches, and circulation. Beneficial for arthritis, sprains, bruises, pulled muscles and other unbroken skin injuries with pain. Topically apply to the area that is causing pain. 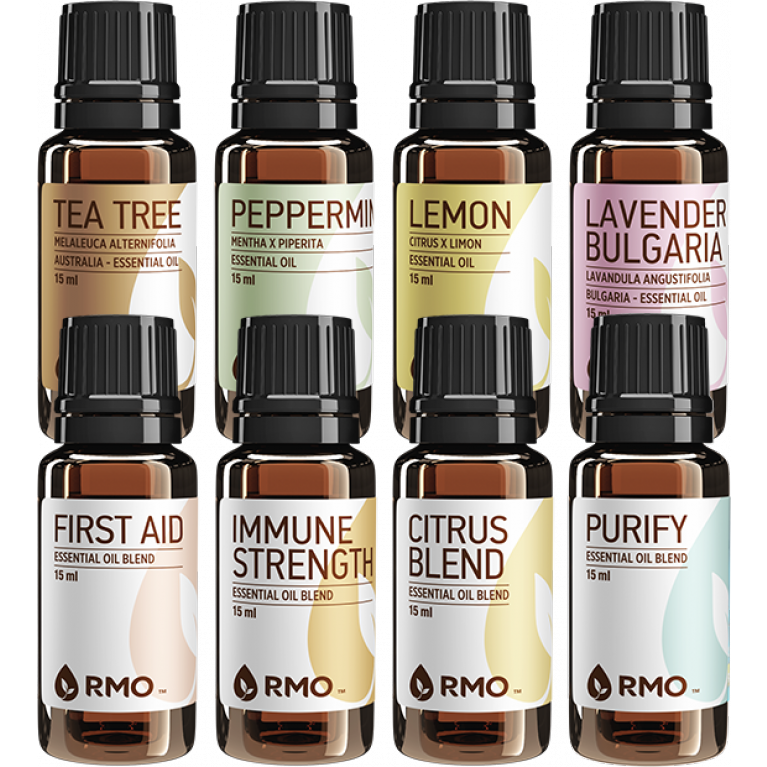 RMO's best selling essential oils, all in one kit at a great value! 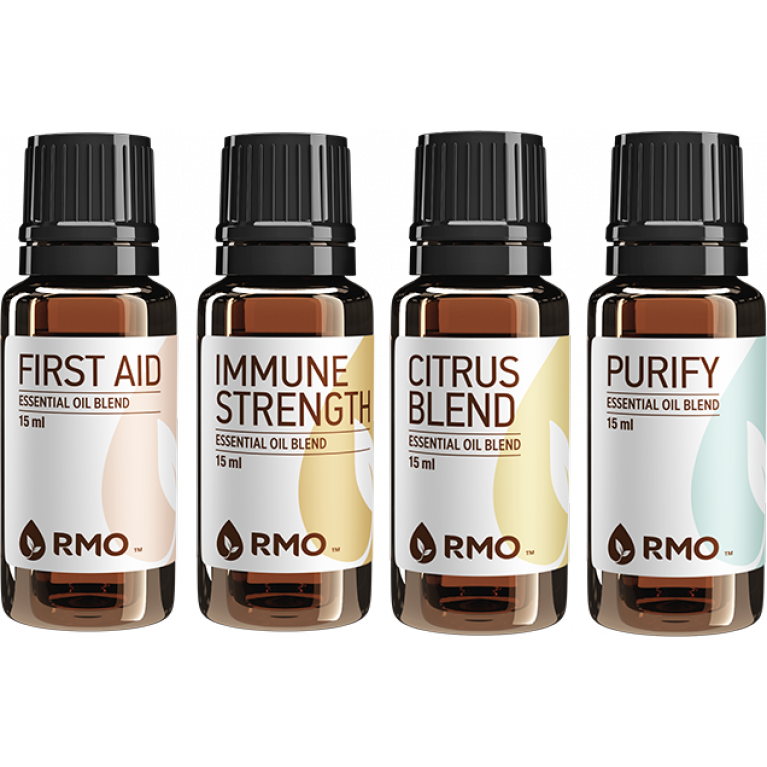 With the Single Essential Kit, you'll have an arsenal to maintain and improve your overall well-being and create your own mixes and products. 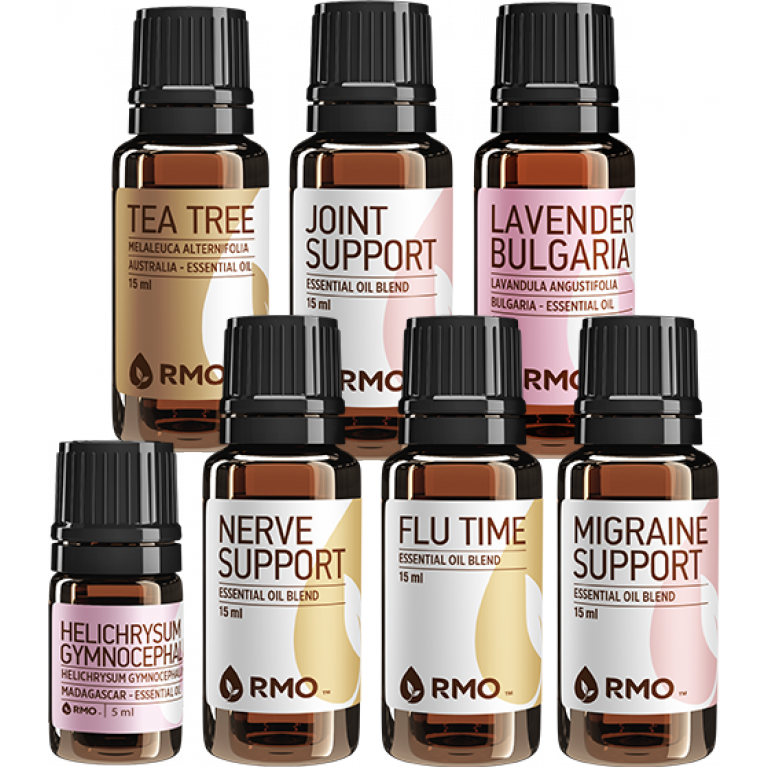 The essential oils in this collection are excellent for: Relaxation Promotion of health and the immune system Mood enhancement Soothing and cooling minor aches, pains and skin irritations Fresh scents and cleaning ...and much more! 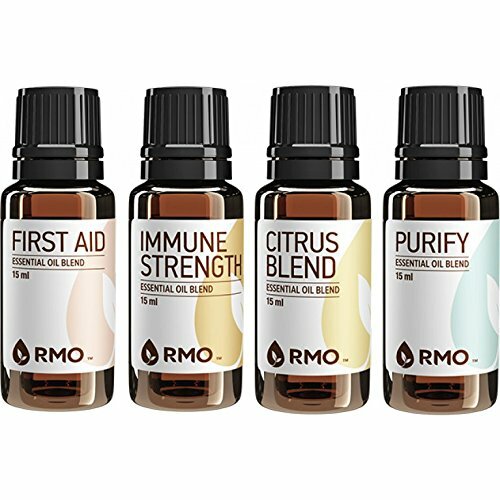 RMO's Single Essential Kit includes: Lavender - The "go-to" oil that can be used for nearly everything and can be blended with nearly every other oil. Lemon - Bright fresh lemon peel scent for health, household refreshment and skin care. Peppermint - With an herbal fresh minty smell, use it to soothe the skin, support the immune system, add flavor to recipes, freshen your breath, and more. Tea Tree - A powerhouse oil for supporting the immune system, the respiratory system and topically soothing skin. Formulated to promote relaxation allowing us to relax so the blood can get up to the brain. Grounding and integrates energy allowing us to visualize our goals and dreams more vividly and accurately. Assists in reducing depression, eases anxiety, stress, and tension bringing joy to the heart, balances and stabilizes the emotions, gives patience and calms worries. May assist hyperactive children in creating serenity in their life. Has been found beneficial when used with children that have frequent nightmares. It may assist in curing the smoking habit. May be applied under nose, back of neck, and diluted with massage oil to rub on back. Add to bath water. May be applied to navel, legs, and back of neck for insomnia. Wear as a perfume or cologne. It has been used in a diffuser to assist in calming active or hard to manage children, also in the evening to relax the entire family. While traveling with small children put 10 drops in a 2 oz spray bottle, add water, shake, and spray around the car (it does miracles). This synergy has assisted people coming off drugs just by diffusing it. Calming is composed of oils known for their calming effects. It creates a sense of well-being and promotes relaxation. Beneficial for insomnia, worries, very soothing, brings patience, inspiring harmony, joy, gratitude, and balances emotions. When diffused, it calms tensions and stress, diminishes depression and eases anxiety, is uplifting giving a sense of deep peace. Massage on the bottom of feet before bed may assist in a peaceful nights rest. Calming is especially beneficial for children after an overactive or stressful day. It is a blend of oils that synergistically provide you with nearly miraculous relief from inflammation and associated pain. It is calming as it eases nervous tension, stress, and poor circulation. Migraine Relief is uplifting, stimulates the regeneration of new cells, and eases anxiety, worries, and fear. It assists with headaches and migraines, balances extremes in emotions, and provides comfort during times of grief. It is beneficial for lowering blood pressure, relaxes the mind, and assists with muscular aches, pain and stiffness. Migraine Relief assists with spasms, fatigue, infections, fluid retention, sprains, cramps, depression, and acts as a sedative. Apply a few drops topically to the back of the neck, across the forehead, and on the temples. Lemongrass (Cymbopogon citratus): Is anti-fungal and an immune stimulant. It helps clear infections and is an insect repellent (fleas, lice, ticks). Rosemary (Rosmarinus officinalis): Is anti-infectious and antibacterial. Preventative for all respiratory infections, congestion, sinusitis, bronchitis, chills, colds, flu, and infections (especially staph and strep). Tea Tree (Melaleuca alternifolia): Due to its antibacterial, antifungal, antiseptic, and antiviral, properties, this oil helps clean the air, kill off fungi and bacteria, and can help restore proper respiratory function. Lavender (Lavandula angustifolia): Lavender is the oil that can be used for nearly everything and can be blended with nearly every oil. 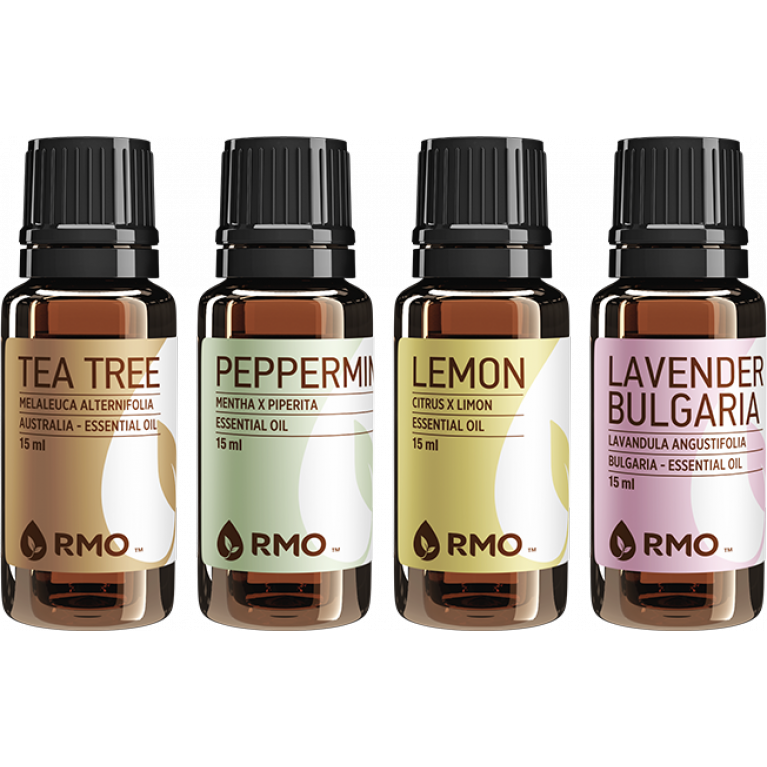 Will help bring together all of the oils in this blend and enhance their properties. Myrtle (Myrtus communis): Is a great antiseptic oil. It is a good deodorizing oil. It will help treat all pulmonary disorders. Citronella (Cymbopogon winterianus): Is an insect repellent and room deodorizer. It helps treat minor infections and is a key oil for getting rid of intestinal parasites. Formulated to strengthen the immune system and is a powerful all around maintenance oil. It is beneficial against infections, inflammation, viruses, bacteria, fungus, parasites, and microbes, a general tonic, supportive to the nerves, respiratory, urinary and circulatory systems. 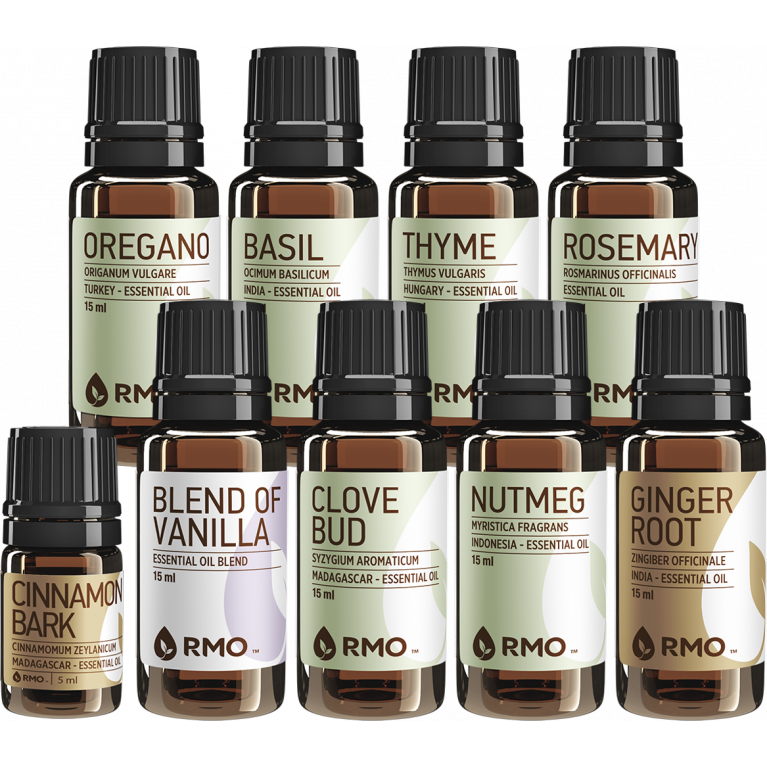 Because of the oils in this formula, it assists in protecting the body from the onset of malaria, flu, colds, and coughs. Apply to: Feet, wrists, diluted on throat and around ears, to gargle - 2 drops in 1/2 glass warm water. 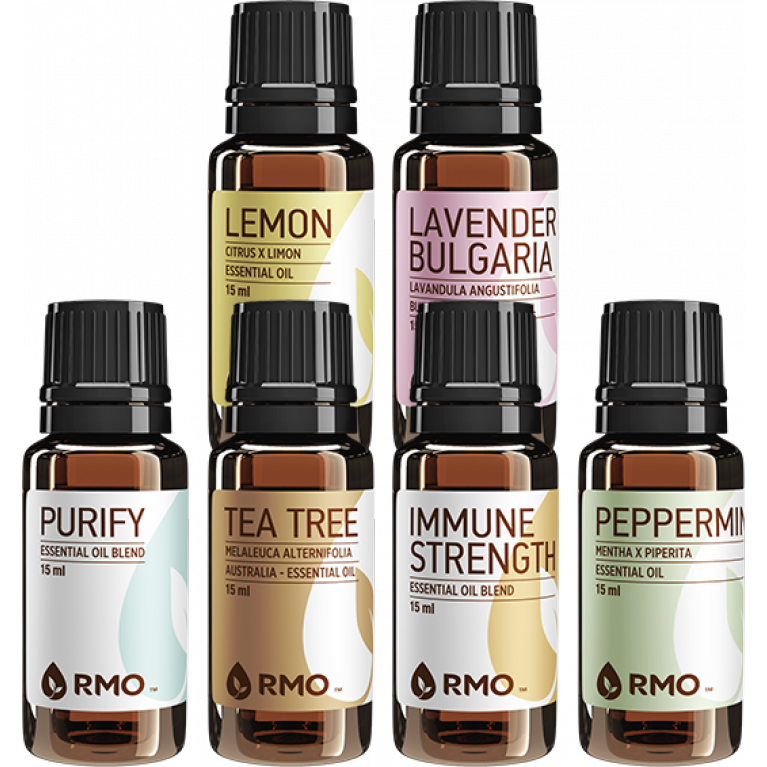 Dilute one drop of Immune Strength with 5 to 15 drops of massage oil and massage the thymus and under the arms to strengthen the immune system. Has been effective when massaged on the feet twice daily. 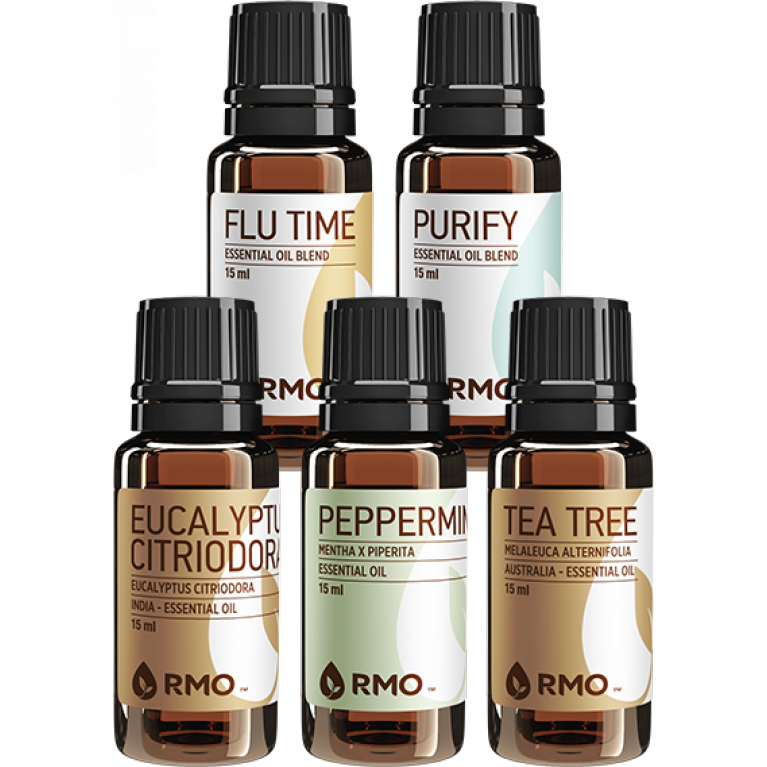 Diffuse periodically 30 minutes at a time, especially if there is sickness in the home. Great oil for the skin! Anti-inflammatory, antiseptic, anti-viral, major anti-infectious (staph and strep), bactericidal, anti-fungal, anti-parasitic and insecticide. Beneficial for respiratory, infectious disease such as chickenpox, healing wounds, fungal infections (athlete's foot, candida, jock itch), tonsillitis and gum disease. Use for: rash, sunburn, digestion, diarrhea, vaginal thrush, immuno-stimulant, abscess, acne, cold sores, burns, shock, hysteria, warts, lice, tuberculosis, sinusitis, whooping cough, colds, flu,, tissue regenerator, ear nose and throat infection, stimulates lymphatic circulation. Massage onto skin with carrier oil. Is beneficial in assisting the alignment of the physical structure of the body and repairing injuries of the spine. Massage the oil along the spine, wrists, throat from the neck to the thymus, feet, temples and forehead. When you Feel Brain tired, balance the brain by rubbing a drop of Aligning on your temples. Top oil for hair growth! After applying hair growth every day for 12 weeks, one of our customers reversed the balding process! 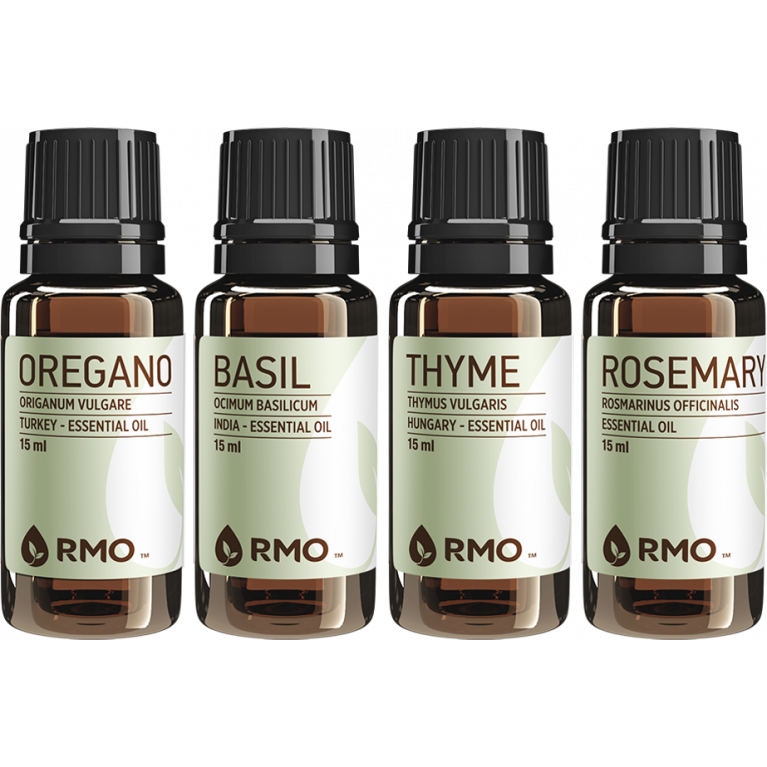 Because the leaves are used in distilling, our Rosemary essential oil contains more cineole than most competitors' rosemary oils. It is anti-catarrh, anti-multiple sclerosis (supports), anti-infectious, anti-bacterial (this chemotype said to be best used for pulmonary congestion, slow elimination, candida, chronic fatigue, staph and strap germs). 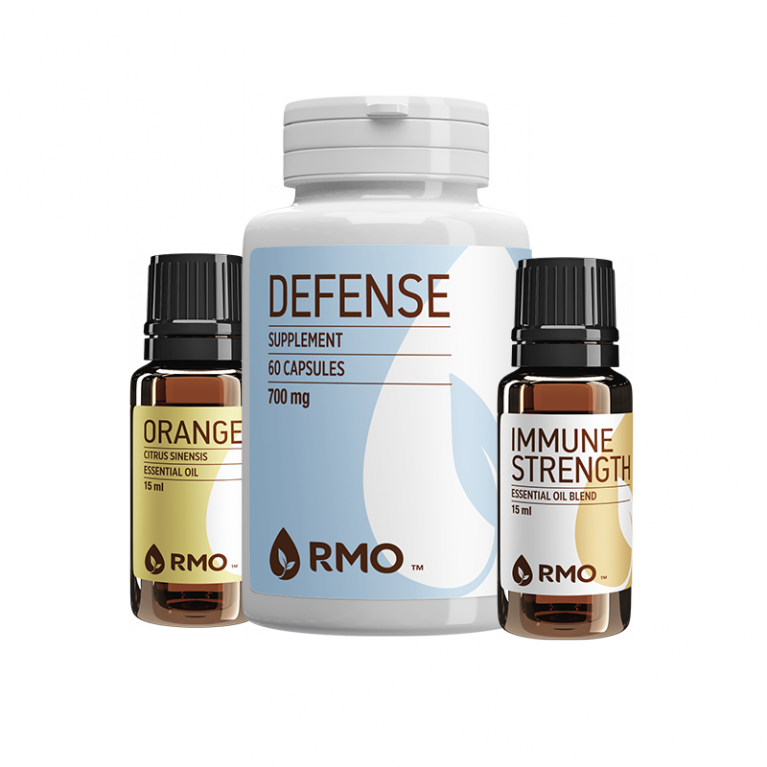 Preventative for all respiratory infections, congestion, sinusitis, bronchitis, chills, colds, flu, infections (especially staph and strep), colitis, dyspepsia, sour stomach, cystitis, palpitations, arteriosclerosis, immune stimulant, nervous exhaustion and stress-related illness. For hair support, rub several drops into hair after showering. 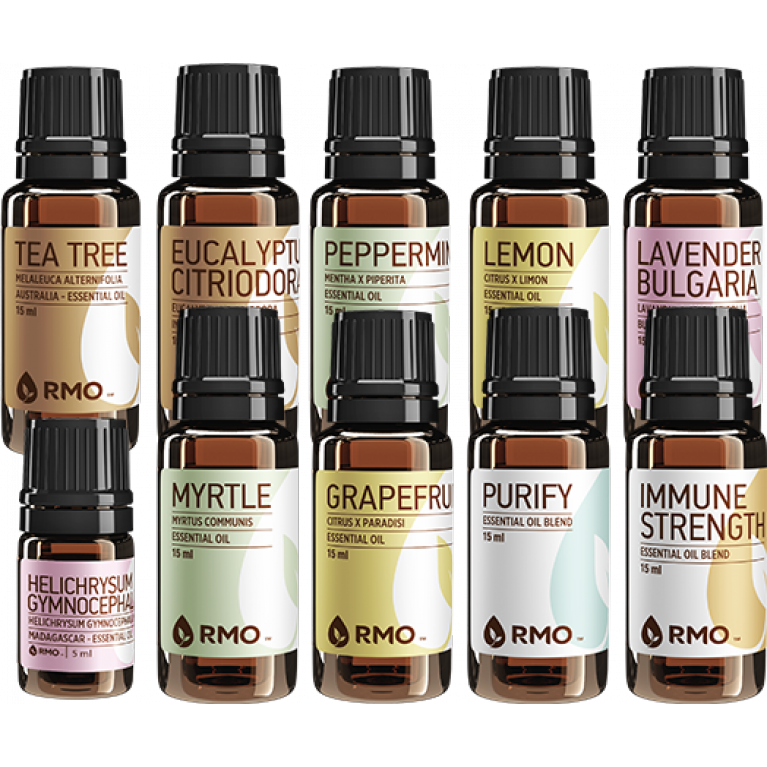 For respiratory improvement, diffuse oil and inhale deeply. When in doubt, use Lavander! Improves digestion, reduces inflammation, purifies body and works as a disinfectant. Use to help sleep at night or improve heart functioning. Massage a few drops into chest to calm heart palpitations. Diffuse a few drops to freshen air. Massage a few drops into the bottom of your feet to boost health. A hybrid of Spearmint and Watermint, peppermint is the most pungent mint. Its aroma is commonly inhaled to revive, energize and refresh. Conversely, one of its most powerful applications is as a digestive soother. This can ease indigestion, constipation, bloating and irritable bowel syndrome. 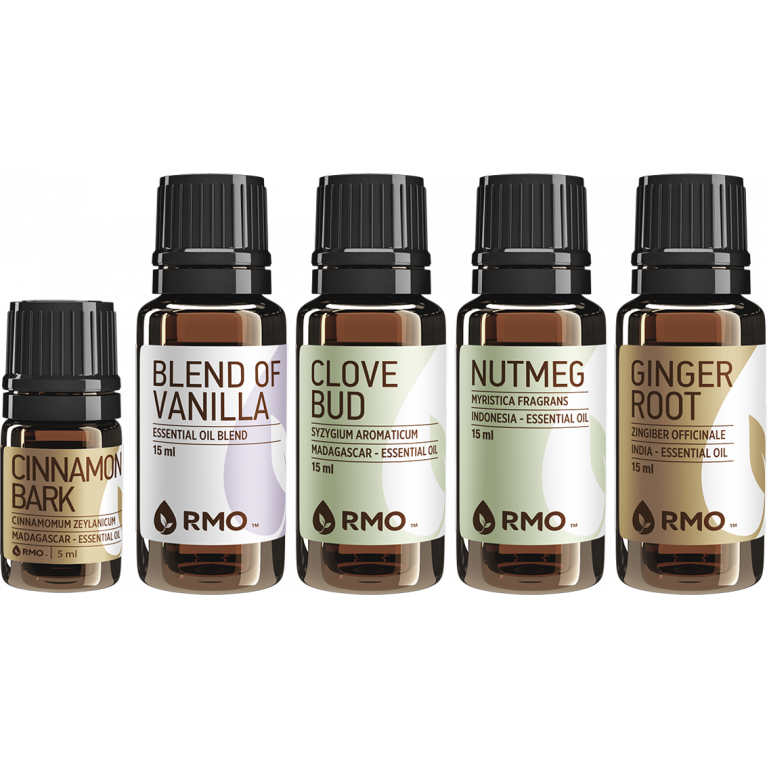 This essential oil has a more traditional peppermint aroma than the Indian version. 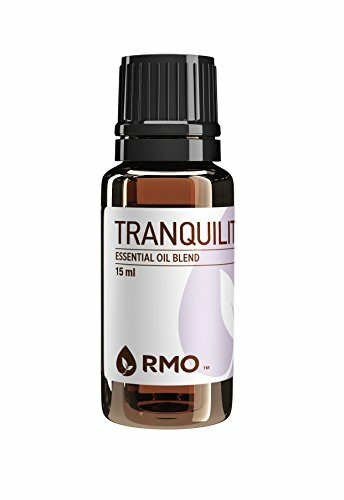 Inhale this diffused oil to increase concentration. Massage over abdominal area for digestive issues. Beneficial for an air disinfectant, the immune system (may stimulate red and white blood cell formation), acne, brittle nails, boils, corns, gland stimulation and purification, warts, arthritis, cellulitis, nervous conditions, high blood pressure, nosebleeds (stops bleeding), obesity (congestion), poor circulation, rheumatism, gallstones, bronchitis, dyspepsia and flu. Put a few drops down your kitchen and bathroom drains. Add 5- 8 drops to your dishwasher load.